Columbia Asia Hospital Nusajaya, finally open! 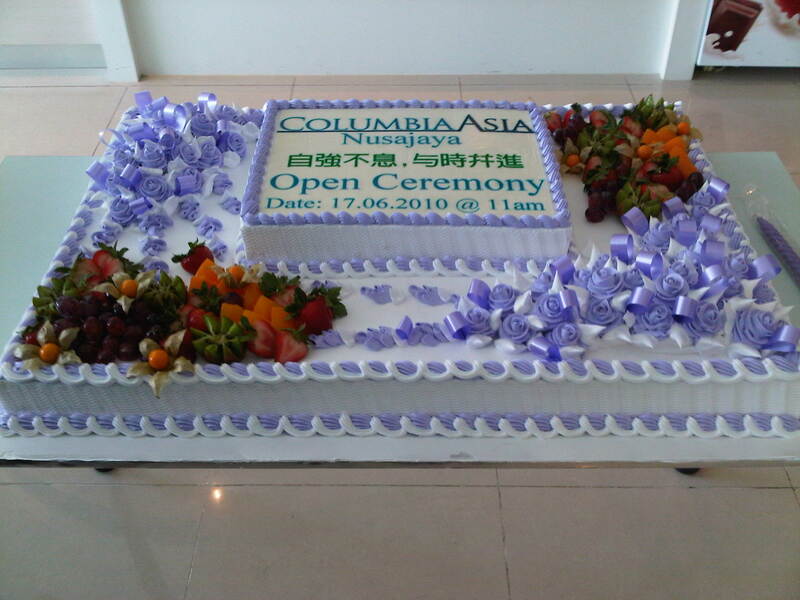 After almost 2 and a half month’s wait, finally Columbia Asia Hospital, Nusajaya is open to public, today 17/06/2010. It was a real pain waiting for the hospital to open from March 2010 till today. The initial opening supposes to be end of March 2010 but due to various delays in issuance of CF followed by the operating license by MOH, we have finally manage to have our soft launch today. Our official opening ceremony will be on 29/07/2010 by the Johor MB. Dr.Teh, one of our O&G specialist bought a cake for the soft launch and it was huge. We have a very good team of doctors down here and we hope the hospital, which is very strategically located, will be a success. I have submitted my resignation as part-time consultant at Regency Specialist Hospital and have also informed Monash of my intention to downgrade my position from full-time senior lecturer to 0.3 fracional staff. Since I love teaching, I will continue teaching as long as I can. As for my clinic in Hospital Sultanah Aminah which I have been running since 2008 voluntarily, I will be slowly phasing it out by the end of the year, or even earlier. BTW, we are still looking for another Physician, Surgeon and Pediatrician. Anyone? We still have vacancy for OT nurse. Pls contact the hospital human resource department at 072339999 Catherine. Or drop by to see the GM Pn Rahani. congrats! actually i was looking 4ward 2 delivering my baby there but then wat can i do, the hosp was launched a week after my due date! hahahahaha! Dear madam… it would be a great pleasure for me to join your team. i was graduated with Bsc (Hons) Physiotherapy from UiTM. i’m now working as a physiotherapy tutor. I would like to be a physiotherapist at this hospital and thus apply all those skills that i’ve learned. thank you. Pls give me your contact number and particulars. If possible come over to the hospital. HI.. I AM A PHYSIOTHERAPIST GRADUATED FROM MANIPAL UNIVERSITY OF INDIA, WORTH 5 YEARS OF EXPERIENCE, WOULD LIKE TO JOIN YOUR ORGANIZATION, THANK YOU. FYI, Columbia Asia Hospital is a private hospital. It is not a government hospital unless your wife wants to resign from goverment service? I diploma holder in healthcare from Masterskill. So difficult to get job because we only learn all basic thing for all department in hospital but i thing is a good advantage. It a new field in malaysia.I hope people will know about this.Do not discriminate us. I had a lot of experience during this problem. I kindly need your opinion doc.tq..
FYI, even myself do not know what is the job discription for your diploma. Are you suppose to be a clerk in hospital setting? The problem in Malaysia is that there are too many colleges/universities both private and public who are offering all type of courses that do not have any job prospect! There is no proper planning by the government, thus for the private college it is a money making business. They don’t care whether there is a job prospect or not! I feel sad for people like you who are told juicy stories when you enroll for the course and then unable to get a job! With the rate we are going, there are going to be a lot of jobless diploma and degree holders in near future including doctors! Even nurses are jobless now! im student nurse,n will graduate on jun2012.. I have over 1 ½ years of experience in the field of dialysis nursing.Now I want to shift in general nursing. I have created and maintained excellent relationships with my assistants and the patients. Dedication, loyalty and hard working are some of my additional qualities.i would like to working at your hospital…pls contact me as soon as possible dr(0102117303)thanks alot dr…. please contact Catherine, the HR manager of CA Nusajaya at 07-2339999. Is there any vacancy in IT department at Columbia Asia Hospital ? Is there is, i would like to give it a try. Thank you.. There is no vacancy in Columbia Asia Nusajaya but you can try the 3 upcoming hospitals in KL, namely Balakong, bukit Rimau and Setapak. i am fresh graduate from MAHSA university college. i was graduated on june 2010. i want to apply a position of staff nurse in setapak.. how is it? can you give me address where i need to submit my resume? helo doc..i agree with your opinion..i very stress about this problem..even my cgpa is good is not enough..yes i can work as a clerk in hospital..there is no specific job in this course..i only try and try harder to get job in this field..tq doc..
thanks.. but i already checked the website.. but i can’t found the address (HQ in Subang). could u give me the address? hi dr..am fresh graduated from MANHSA COLLEGE….i want to apply a position of staff nurse in COLUMBIA asia at Jb. how is it? is it still have a position as a staff nurse? Please contact Catherine, HR Manager at my hospital at 07-2339999.
hi dr..am fresh graduated from MAHSA COLLEGE….i want to apply a position of staff nurse in COLUMBIA asia at Jb. how is it? is it still have a position as a staff nurse? i,m fresh grdduate from segi college..pass LJM..but not get jobs anymore…at ca nusajaya is still job vacancy for staff nurse or not????????? ?if have how i.m want to apply? I am not sure about any vacancy for staff nurse as we just took few more nurses. You can try to contact Catherine, HR manager at 07-2339999.
hi doctor,i would like to apply a job in columbia hospital jb. i only had 2 years experience and worked in ccu/icu. i had passed my basic diploma nursing and post basic coronary care nursing. did the hospital buy my contract??? Hi Dr. I am an undergraduate for Bachelor of Science (HONS) Biomedical Science in UTAR, Kampar. I would like to ask whether do Columbia Asia Hospital in Nusajaya, Johor provide internship for the non-graduates? Next year, I will be having an internship and I am interested in this particular hospital as the primary place for me to gain experience and start my 3-month internship as the first step into working life. Im a degree holder with 15 years experience in a medical line(lab, bimedical engineering,purchasing,hr and administration). At present Im working as a manager in a private medical firm. Kindly drop an email if there is any suitable job. Thank You. please contact our HR manager, Catherine at 07-2339999. We already have a full time Radiologist with us at the moment. With the current patient load, one is adequate. Columbia Asia Bintulu in Sarawak is looking for a Radiologist. i am a qualified nurse from a private college.i had graduate in jun 2009 and continued degree in the same college from august 2009 to may 2010 and discontinued my program due to some financial restriction.i have applied in many hospital in all over the country n have not got any replies.some of the hospital has called for an interview n they r doubting on my skill since i’ve qualified a year ago.what should i do..i love my job n its my ambition to become a nurse to serve the public.. The problem is, there are oversupply of nurses in this country!! Even in my hospital, the applications are pilling up. I have written about this if you view my Education page. Poor planning from the government , as usual. I know nurses who are working in petrol stations!! Next in line, will be doctors. It has nothing to do with when you graduated!! There are just too many applications ……………………………. you can submit your cv to the HQ in subang. Please visit the website for address. i’m jayanthi from johor looking for medical laboratory job. i have finished Bsc. in Biomedicine….is there any vacancy at laboratory depertment? I am not sure whether there is anymore vacancy but you can try to call Catherine , our HR manager at 072339999.
do u still need staff nurses?now am working in Kuantan Specialist Hospital but seeking for new experience…still hv vacancies for SRN? I am not sure. You can call our HR manager Catherine at 07-2339999 for further info. We just took a few new nurses. hye,im a student nurse from INSTEDT college and will graduate in january 2012.but i already looking for a position as a staff nurse at your hospital at nusajaya.for your information,im worried if i dont get the job bcoz mostly they want at least 3 years experience in general nursing.so,how can a fresh graduate like me get the job?btw,we at instedt have one year clinical experience at hospital sultan ismail.so do they count? You can visit us or call Catherine at HR for further info. We did take some fresh graduates before. I have done my Master of Physiotherapy(neurology) in india, After my BPT worked in CARE PHYSIOTHERAPY CLINIC for almost 1 year 8 months and I joined in MPT and worked in BMR group of hospitals in india (timings 5pm-10pm) as a ICU Physiotherapist ,(to support my family)while studying MPT.i can manage ventilator patients and can deliver physiotherapy for all pre and post operative patients,now I came to malaysia in search of my job,Iam in Kuala lampur ,I came to know that there is vacancies at COLUMBIA ASIA HOSPITAL at NUSAJAYA branch,sir if you feel that iam usefull to your hospital and there is vacancies iam ready to come to NUSAJAYA for an interview,please help me sir,and if any valuable suggestions please give me sir. I am a graduate from the the National University of Singapore with a Bsc in Microbiology. I am also a registered polysomnograph technologist. (RPSGT, USA). Currently, I am working as a medical tech in the Pulmonary Function/Sleep Laboratory in Singapore. While I was going house-hunting at NusaJaya today, I was clearly impressed with the building facade of Columbia Asia NusaJaya Hospital. I am wondering whether your hospital has any plans or have already established a Lung Function and Sleep Lab in NusaJaya. If so, I am highly interested to join your highly-esteemed hospital. Sorry, we do not have a sleep lab or a full lung function test machine(except a spirometry). We are a small, community based hospital. hello sir.. i m Karthiga, a pharmacy student from KPJ INtERNATIONAL COLLEGE OF NURSING AND HEALTH SCIENCES who going to graduate on coming September. I interest to work at your hospital after my course because of some reasons. If there is a vacancies for pharmacy assistants (PA) and physiotherapist, i kindly request for your reply sir, so that we can send you our full resume with the proper application. sir,i already quoted my request about physio job,sir,iam still in kl,can u please employee me,i have done my MPT NEURO and i have 3- years experience,pls reply me sir. thank u very much sir,iam very very thankful to you sir. sir,i have spoken to catherina she said that we dont hold a quota for foreigners to recruit,any way i will be in malaysia as i have applied for lecturer post in kl colleges sir,if u got permission from immigration then i will apply sir,thank u very much sir. MY I AM PHYSIOTHERAPIST BY PROFESSION.. I HAVE DONE MY 4 YEARS DEGREE COURSE IN PHYSIO.. DATED:11 / 05 / 2011. I was informed that the hospital has no post for foreigners at the moment. I am a Filipino nurse. I recently graduated last march 2010, and passed the board exam last december 2010. I am looking for nursing staff job position in your hospital. I have no experience yet, however, I am willing to be trained. I am good in english communication. Your reply would be greatly appreciated. Thank you so much..
please contact my human resource manager Catherine at 07-2339999. I am a graduate from MAHSA University College. Currently working at Singapore National University Hospital as a staff nurse @ O&G outpatient Specialist Clinic since 02.08.10. would like to enquire any vacancy at the moment for staff nurse at your Hospital. Please contact Catherine, our HR manager at 07-2339999.
is there any radiographer vacancy at columbia nusajaya hospital. can i know how i can contact your HR in subang. i’m waiting for ljm result…can i apply job in your hospital before the result come out???? Pls contact Catherine at 072339999 for further info. My name norshawani ahmad zaini, from KPJ university college(nilai). I just pass my final LJM on JUNE 2011. Is it still have chance for me to get place as STAFF NURSE at this hospital. Pls contact Catherine, our HOUR manager at 072339999 for further info. Please contact Bintulu Hospital directly. Hello dr,im mageswari ,fresh graduated in diploma in nursing from mahsa university college,i would like to apply for ht post staff nurse at columbia nusajaya hospital doctor and how sir? please contact Catherine, HR manager at 07-2339999. Pls contact Catherine at 072339999. NO, pls contact the HQ at Subang. I diploma holder in healthcare management from Masterskill ipoh. So difficult to get job because we only learn all basic thing for all department in hospital but i thing is a good advantage.i hope i will get good oppourtunity to your hospital…i kindly request for your reply.thank u…. You can try to apply to columbia Asia but not sure of vacancy. At Nusajaya, we do have vacancy for Customer Care. Hi Dr..I’m Khairul..is there any job vacancy as a radiographer at Columbia Asia Setapak?I’m a diploma holder in medical imaging graduated from MAHSA University College.Can you give me e-mail for this hospital so I can submit my resume? Columbia Asia setapak just opened on 9th Jan. You can contact the hospital directly. best is to go there directly. You can try to apply. I think we just recruited one and probably need another. You can apply to our HR manager Catherine. We, Yoganthri paul Raj and Dewashini Annadurai are from Kolej MASA (Malaysian Academic And Skill Advancement) students, seeking for internship placement in your hospital. We are ongoing diploma course in IT field majoring in Information Engineering. We are looking for internship placement in Laboratory Department where we will be going through training based on computerized devices. is there any place to do internship in your hospital? Hi Dr. i am looking for the post of a Medical Laboratory Technologist..is there have any vacancy for lab technician or lab assistant? I will be graduating on June 2012, with a Diploma in Medical Laboratory Technologist. I have acquired various skills and knowledge in this field . I also have working experience as medical laboratory technologist (MLT) during my training program in Hospital Sultan Abdul Halim, Kedah. hye doc..iam ex staff nurse from columbia asia bukit rimau.I was waited almost 1 year for transfer while working at bukit rimau hospital .But according to my matron,currently there was no vacancy.Atlast i was resigned from there on 22th jan 2012 and now jobless.Main point i looking for nusajaya because my house just near to the hospital..Any vacancies at Nusajaya doc? I think there is a form for you to fill up. You probably have to come over and see Catherine personally. I am not sure whether there is any vacancy. hai dr..i heard there is a vacancy for a position that i waited for this long in columbia asia nusajaya..but when i applied, i got response that they dont need staff from the same races. Quite dissappointed…because in my opinion abilty and talents much more important than one’s race or religion..I keep on trying but my efforts were discouraged…Hope i can get any job there that suits me in future..TQ.. Sorry but I don’t really have any control over human resource department. hello Dr.. can i know how much does it cost doing gastric bypass surgery in Columbia hospital? hai.doctor ,good morning.h r u ? I ‘m a radiographer working in dxb since from 7 yrs.Dr.is there any vacancy for the same post .how I’ll apply? any job at columbia hospital as radiographer..
Hi Dr., I hv finish my SPM and wud like to apply for sponsorship for diploma in Nursing or Physiotherapy with Columbia Hospital in Malaysia, whom should I contact , Thanks! i can’t contact catherine.. when i e-mail her,she did not reply my email.. when I call .. I still did not communicate with catherine.. when I asked why. The customer line told me he could not connect me with catherine.. so, how can I find out about jobs available here? I am a bit disapointed. I waited almost two months of email replies from catherine..
pls contact the HQ in subang. I’ve completed my degree in physiotherapy (a franchised UK programme),Im a Malaysian, a fresh graduate from Mahsa University College, whom would like to join as a part of Columbia Asia Hospital Nusajaya health care team member..Tq. after you graduate, you can apply to our hospital. No guarantee. good morning dr……….im christina aparoo, currently working in subang jaya medical centre in icu department for 5 years….. im going to settle down in jb soon, taman bukit indah and im finding for job in columbia… i have send my resume to HR but there is no news, almost 1month plus…. is there any vacancy doc? Which HR? KL or NUsajaya? We might start the recruitment in JUne or July for our final ward extension. Pls keep in touch with our HOUR or Matron Khoon. I applied for nusajaya columbia,doc. Thanks to reply me…will folllow up with matron khoon. At the moment we do not have any post yet. You can try to contact our Human Resource manager, Catherine at 07-2339999.
hi doc..its really nice of u to reply all the message.i am looking forward to work there as soon as i come back from saudi.bcoz my house in bkt indah n most of my frens working there.mdm koon was my ex matron in kempas..hope i will get the job..wish me luck..hope there is vacancy still in september…y no hemodialysis unit…i am a dialysis nurse.. Yes, you can contact Matron Khoon for further info. Pls contact Catherine our Human resource manager. At the moment we are full for nurses but may consider when we open our remaining 30beds later this year. hello sir,how r u?i’m kanimozhi…student of unitar and done with my bachelor degree in management.I would like to know that any vacancy in management or reception site in columbia hospital,nusajaya thank you! I don’t think so but you can try to contact our HR manager Catherine. There are a few hotels coming up in Nusajaya, worth trying. thank you for your kind response sir!!!! HI.MY NAME IS NUR ATHIRAH BT RAMLI, IM FRESH GRADUATED FROM KUALA LUMPUR METROPOLITAN UNIVERSITY COLLEGE AND I HAVE EXPERIENCED PRACTICAL EVERY SEMESTER. I REALLY INTERESTED THIS JOB. Dear madam… it would be a great pleasure for me to join your team. i was graduated with Bsc (Hons) Physiotherapy from Asia Metropolitan University. I would like to be a physiotherapist at this hospital and thus apply all those skills that i’ve learned. thank you. Ref: Application Letter For Occupational Therapist. I’m writing to express my interest in the Occupational Therapist position. While much of my experience has been in the occupational therapist world, I understand the social value of the non-profit sector and my teaching experience will be an asset to your organization. I was liked to apply for position in your center as occupational therapist. I want join your company. Do teamwork to deal with the customer/client, always present my best, be cautious when handling the customer/client and punctual. 2. I have completed my Diploma in occupation therapy from Asia Metropolitan University College. I believe my qualifications will fulfill conditions position I applied. I have rather clinical placement working experience just 5 month at Hospital Puterjaya for hospital based and 2 month Joblink Centre at Pinang for physical based, 2 month Early Intervention Program – Autism for pediatric, 2 month EVE CARE for psychiatry and 2 month DAMAI CARE for geriatric and also doing home visit at client home. I appreciate you for checking my application. Here I have been including resume and transcript for reference. If you wish to contact me. Please contact my number 0164520811.
hi sir. My name is ananthi. I have 20years of experience in nursing. 10years in icu/ccu and I did my post basic. 10 years in hemo/capd/renal transplant. I have worked in Saudi for three years. just came back. have worked as clinical instructor/charge nurse and also standby headnurse in one of the busy military hosp in Jeddah. currently finishing my degree in mahsa. Plan to start my masters once finish my degree.Looking for management job or teaching in your hospital in jb. I am settled in Johor. Hoping to hear from you. thank you. hi..im Aida,nursing, graduate from segi university on dec 2012. still jobless. i need to know if stil have vacancy on your hospital. thanks. Hi sir, I am a fresh graduated student in medical lab technology.I have just finish my practical lesson in hospital port Dickson. I am really wish to be one of the staff at Columbia Asia hospital. Hope that I can get your reply soon. hello, im fresh graduates currently working at Singapore as a healthcare assistant since january . i still looking for Nursing jobs at Columbia Asia JB . Can i know where can i submit my resume?. Please contact the HR office, 07-2339999. I am not sure if this is the right place to voice my frustration ! I have been following your blog for sometime now since the idea of moving back to Malaysia keep cropping up in my head. My story began when I was invited by Talentcorp to attend one of their function in London a year ago. I have been a consultant in a well known tertiary university hospital in the UK for more than 5 years now. Being a Malaysian I always wanted to be near to my family in Malaysia, hence the call of coming back to the “tanah air” is really strong. Being away from Malaysia for more than 25 years making the decision to return extremely difficult, on top of that I am working as a consultant in a well respected unit by my peers nationally in the UK. The function organised by Talentcorp together with numerous University and private institutions was impressive. I had numerous job offers from these institutions. Finally I settled with the one that I am most comfortable with. Following an interview and a visit to the particular hospital, everything was formalised. My nightmares began the moment I started the registration process with both MMC and NSR. Though I was granted a full MMC registration after 4 months of submission the NSR is still dragging it’s heel. It has been more than 6 months now and I am still getting no where! Though it is not required by the law at the moment to practice as a specialist in Malaysia to have a national specialist registration, however it is a requirement to get an exemption from compulsory public service. Hence a word of caution for those doctors who wants to go home to serve the country! Beware! Though certain government departments are encouraging you to go home but not all will work towards this. Welcome to “Bolehland” bureaucracy. Getting the NSR for compulsory service exemption is something new to me. This is because, the exemption is given by MMC and what I know is that, if you have worked more than 10 years overseas, you are exempted. That is the point I am trying to make, the goal post seems to move all the time! No one is in charge and time stood still in the government department ! I wonder if the hospital offers a sponsorship for physiotherapy students? hai Dr, did your hosp still need a NICU staff nurse? I have experience 7 years in NICU and now I’m a lactation councellor in Puteri Specialist Hosp JB.. Or.. maybe I can be as a night supervisor in your hosp?I already send my resume via jobstreet.com.. but still no reply..Your hosp is more near to my house..and I need to upgrade my skill to a new experiance,companies and hosp.. Upon graduation, it is my intention to pursue a position as an Occupational Therapist. This position would enable me to continue learning and experience. My clinical experience in , Neurological, pediatric , psychiatric,hospitality and geriatric have enabled me to develop skills that prepare of the responsibilities of a care partner. My love for obstetrics makes me eager to learn and to give everything I already know to fulfill the duties of this position accurately, safely, and enthusiastically. I would appreciate to be a part of your Facility team and contribute my skills to your staff and patients. Thank you for considering my resume. I would welcome the chance to meet with you to discuss the possible employment opportunities. I look forward to hear from you. Hi Dr, I’m graduate from masterskill global college december 2013. I would like to apply for physiotherapist position in columbia hospital especialy in Sarawak. Please contact me if you have any vacancies. hai Dr.im kumuthamalar Sivanantham from technology park malaysia college and fresh graduated in biomedical science course (diploma).i would like to get good exposure and experiences from columbia asia hospital.There is any vacancy dr?tq dr.
please contact our human resource department. i am a fresh graduate and Diploma Holder in Medical Assistant…im looking for job as a Assistant Medical Officer…is there any related vacancies in your Hspital ? May i know any vacancy as a staff nurse at columbia hospital Nusajaya? I was graduated from MAHSA UNI on November 2013. Currently I’m working as physiotherapy in a private centre called Happy Land Special Edu Centre. I’m looking for a different environment especially at hospital where I can apply all the skills I have learned. I’m prasanna krishnan. Currently looking for new job at new place. I have a total 9 year working experience as an ED nurse. If there is any vacancy please notify me about it. Thousands of thank you. You can contact our HR if you are interested. Hi doctor, I’m prasanna from jb. I’m a ED nurse and I have total 9 year’s of working experience. Would like to apply for better experience and prospect in future.